The organizers of the 2015 Marion to Bermuda Cruising Yacht Race are presenting a series of information sessions this month. Created to help sailors prepare for an offshore race to Bermuda, the sessions will be held at West Marine stores throughout the Northeast. Topics include boat qualification, boat and crew preparation, communication and safety equipment, watch schedules, customs requirements, costs and logistics, when to begin preparations, nuances and strategies for navigating Buzzards Bay, the Gulf Stream and the approach to Bermuda, and the hands-on mentoring program provided by the Marion Bermuda Race support team. Presentation times are either 10 am or 2 pm. Contact your local West Marine for the specific time. The 20th running of the Marion Bermuda Race starts June 19, 2015. Since 1977, this biennial 645-mile ocean race event has been a Corinthian event for amateur sailors aboard cruising and racing/cruising monohull yachts. The race is organized and run entirely by hundreds of volunteer members of The Beverly Yacht Club, The Blue Water Sailing Club and The Royal Hamilton Amateur Dinghy Club. For more information, contact Bob Kostyla at bobkostyla@yahoo.com or visit marionbermuda.com. The 3rd Annual PJ Boater’s Maritime Festival, presented by the Incorporated Village of Port Jefferson, NY in partnership with the NY Marine Trade Association, takes place in Port Jefferson, NY on May 3 & 4. 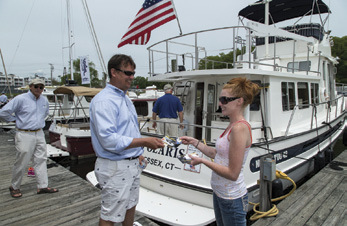 A highlight is the Port Jeff Boat Show, with over 50 boats on display. Maritime-related attractions, museums, and organizations will be present, along with free demos for sailboats, kayaks, inflatables and paddleboards. The Long Island Outdoor Communicator’s Network will present an art and photo exhibit, outdoor book exhibits, marine ecology talks, educational beach walks, Heroes and History vignettes, retrieving dog demonstrations and kayak safety demonstrations. The School of Marine and Atmospheric Sciences at Stony Brook will offer tours of the Sea Wolf research vessel. Other exhibitors include the Long Island Maritime Museum, the Maritime Explorium, Riverhead Foundation, the Long Island Aquarium & Exhibition Center, and the Greater Port Jefferson Northern Brookhaven Arts Council. Other attractions include clam shucking and eating contests, the Harbor Bistro food court, beer from the Port Jeff Brewery, live music throughout the festival, pirate shows and treasure hunts. Port Jefferson Harbor offers easy access and deep draft for boaters, with shops, restaurants and Festival attractions a short walk from the marina docks. For more information, call 631-418-6699 or visit portjeff.com. Springline Yacht Sales has added Island Packet Yachts to the new product offering at their offices in Mystic, CT and Mamaroneck, NY. Serving the Long Island Sound market including greater New York City through Rhode Island, Springline offers a variety of services to existing Island Packet owners, too. Island Packet Yachts’ exclusive design features, proprietary material technologies, unmatched resale values and an awardwinning customer service network all combine to make Island Packet the benchmark for cruising yachts. Every Island Packet is the result of the consistent application and continuing evolution, which affects everything from the initial design concept through the manufacturing process, into the warranty period and beyond. “Teaming up with Springline on the Island Packet line made perfect sense for us,” said Bill Bolin, Vice President of Island Packet Yachts and Blue Jacket Yachts. “They not only have in-depth experience with the product, but also are currently the Dealer of the Year for our new Blue Jacket line.” For more information, visit SecureYourDream.com or call 860-415-4810. West Marine opened a Flagship store in West Islip, NY in March, and is opening its newest store in Warwick, RI this month. The grand opening celebration, at Warwick Commons at 399 Bald Hill Road (across from the Warwick Mall), will take place the weekend of April 11-13. Festivities begin each day at 8 am with special instore events, a mini boat show, tips from experts, marine electronic demonstrations, door-buster deals, giveaways and raffles. At 13,000 square feet, the new store is twice the size of the previous Warwick location, with expanded assortments throughout the store. There’s an enhanced electronics department with multiple units to touch and test, a large engine systems department (including a parts counter) as well as paddlesports, boats, motors, fishing equipment, trailers, safety equipment, casual and technical apparel, foul-weather gear, footwear and accessories. The 18-person crew at the Warwick store has a combined 150 years of boating, fishing and sailing experience, including 100 Ton Masters. They have collectively cruised almost 10,000 nautical miles. Highlights of the West Islip store, located at South Shore Commons at147 W. Sunrise Highway, include a comprehensive engine parts department, an extensive selection of sailboat hardware, inflatable boats and motors, and a stand-up paddleboard “shop” with boards and accessories for every budget. Visit westmarine.com for more information. As the company’s first dedicated Project Manager, Nick Fawle will focus on providing seamless correspondence between dealers, customers and the factory throughout the build process. “From the first barrel of resin being opened to hoisting the sails on the first cruise, Nick will ensure the communication between the factory and client is transparent and frequent, providing the attention to detail that our customers expect,” said Borges. “I am excited to be joining USWatercraft who are so well known for their product quality, leadership in the industry, and commitment to client service,” said Nick Fawle. For more information, visit uswatercraft.com. Brewer Yacht Sales and Brewer Yacht Yards are presenting the Brewer Spring In-Water Boat Show at Brewer Pilots Point Marina in Westbrook, CT April 26 & 27. This show is New England’s largest in-water used boat show, with over 80 boats from 16 to 60 feet on display. Owners will be aboard to answer your questions. Surveys and sea trials will be done after the show when offers are agreed upon. Local marine vendors will be on-site to assist with yacht transport, sail design & repair, yacht finance/re-finance, insurance, canvas, saltwater tackle, boat detailing, boat lettering, boat towing & assistance, slips/storage, junior & adult sailing, and surveying, as well as Brewer Awlgrip/gelcoat specialists and Brewer mechanics. The show will be held rain or shine, and the hours are 10 am – 4 pm on both days. There is no charge for show parking, admission or slip space (based on availability). 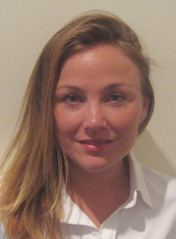 To list your boat, contact Jackie Joslyn at jjoslyn@byy.com or 860-399-6213, or log onto breweryacht.com/boatshow. Several new sailboats, trawlers and downeast-style powerboats will be on display, including Alerion, Bavaria, Beneteau, Bennington, Blue Jacket, Catalina, Chris Craft, Hanse, Hunt Yachts, Hunter, J Boats, Jeanneau, Lagoon, Minor Offshore, Nordic Tug, Southport, X-Yachts and others, as well as kayaks, paddleboards and select brokerage yachts. Highlights include the Blue Jacket 40, Cruising World’s “Best Mid-Sized Cruiser 39-41 feet” and “Domestic Boat of the Year,” and the Alerion 41, one of SAIL’s Best Boats for 2014. Another must-see boat is the Bennington Q StanCraft pontoon boat. With mahogany trim and luxury seating, it’s the ultimate party barge. Also on the docks will be new Nordic Tug 34 and 54. Admission and parking are free. Mystic Shipyard, located at 100 Essex Street, is close to downtown Mystic’s shops, restaurants and historic Mystic Seaport. If you’re interested in exhibiting, contact Anne at WindCheck at 203-332-7639 or anne@windcheckmagazine. com. 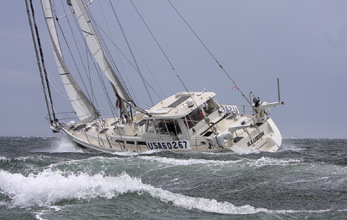 For more information, visit sailquestboatshow.com or facebook.com/sailquest. Jump start the boating season by heading to Rhode Island the first weekend in May to experience a unique statewide boat show that takes place in four venues throughout the Ocean State. The annual Rhode Island Boat Show, now in its fourth year, is a great opportunity to travel along this New England coast and see used and new sail and powerboats, get out on the water in sail and powerboat classes, explore more of Rhode Island and its excellent waterfront facilities, and meet experts and staff from local boating businesses and dealers. Show attendees use this show not only as a way to shop for boats and gear, but also as a way to research berthing, service and winter storage facilities in Rhode Island, a state with a no-sales-tax policy on boats and boating services. The boat show’s four venues include Bristol Marine & Fleet Yacht Sales in Bristol, Conanicut Marine Services and Latitude Yacht Brokerage in Jamestown, Silver Spring Marine in Wakefield, and Brewer Greenwich Bay Marina and Marinemax in Warwick. The show is owned and produced by the Rhode Island Marine Trades Association (RIMTA), working in concert with the local marine industry. For more information, visit rhodeislandboatshow.com, call 401-396-9619, or see the show’s Facebook page for the latest news on this unique springtime event. The National Coast Guard Museum Association, a private nonprofit organization dedicated to the preservation and promotion of the United States Coast Guard history and tradition, has announced the signing of a Memorandum of Agreement that will facilitate the establishment of a National Coast Guard Museum. The proposed facility would be built along New London’s historic waterfront district. 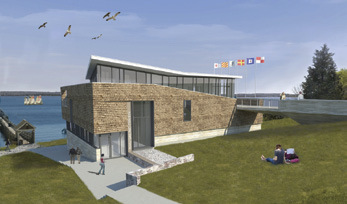 Plans include a four-story, 54,300-square-foot building with four floors of interactive exhibits, event space and lecture rooms, a reception area with gift shop and café, as well as a pedestrian overpass across the railroad tracks to connect the museum with the Cross Sound ferry terminal and train station, and dockage for the U.S. Coast Guard Barque Eagle at an adjacent pier. The National Coast Guard Museum Association is currently engaged in a fundraising campaign. Through minimum donations of $1,000, $5,000 or a three-year commitment of $15,000, donors will become members of the “Barque Eagle Society” and receive a limited edition portrait of the Eagle by Coast Guard artist Tony Falcone of Prospect, CT. For more information or to make a donation, call 860-443-4200 or visit coastguardmuseum.org. Roger Williams University in Bristol, RI expects to begin construction on a new sailing center in late May. The first floor of the two-story, 6,000-square foot building will have men’s and women’s bathrooms/locker rooms, storage space for the RWU sailing team’s boats, and a drying closet for sailing gear. The second floor will have a kitchen and an outdoor deck for spectating during regattas. RWU announced its plans for the center last May, after raising $1.7 million toward the project’s $3 million price tag during the 10th Annual Captain’s Cup Regatta. The facility, which should be operational by next spring, will be the hub for the school’s sailing team, a co-ed program at the school since the late 1970s. Under the leadership of Head Coach Amanda Callahan, the RWU Hawks have been a top-ranked collegiate sailing team in the U.S. since May 2011. 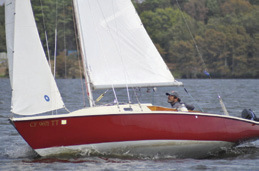 The Ensign Class Association is raffling a new Ensign class boat. The winner will receive a new Ensign Classic (hull # 2032), a standard Ensign Spars racing package, an Ensign Spars deluxe trailer, a Honda 2.3 outboard, and a set of sails. The package is valued at $46,000. Raffle tickets are $100, and a maximum of 650 tickets will be sold. The drawing is June 15, 2014. Proceeds from this raffle support the Ensigns Forever Program, a lease initiative to help fund new members in Ensign fleets around the USA. “The Ensign is an outstanding daysailer, a great family boat, and a fun boat to race,” said Ensign Class Association Commodore Mike Macina. The class is also continuing its Junior Sailing Initiative, in which fleets partner with junior sailing programs to expose youth sailors to keelboat sailing skills and to develop opportunities for junior teams to sail regionally and in the national championship. 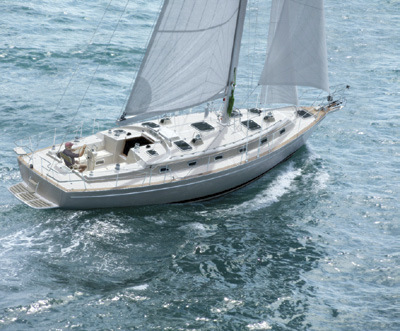 The 22’ 6” Ensign is the largest class of full keel boats in North America. It was designed by Carl Alberg and built by Pearson Yachts of Portsmouth, RI, who manufactured nearly 1,800 boats from 1962 through ‘83. Its popularity, rather than declining with the advent of very high performance boats, has been on a major upswing. To enter the raffle, visit ensignclass.com/ 52-win-an-ensign23. Rhode Island Governor Lincoln Chafee has signed an executive order establishing the Rhode Island Sailing Events Commission, a board charged with identifying and attracting more internationally recognized sailing events to the Ocean State. 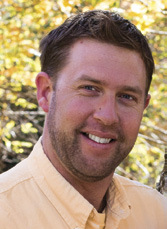 Michael Keyworth, General Manager of Brewer Cove Haven Marina in Barrington, RI, will serve as Chairman of the commission. “With Rhode Island’s rich sailing tradition, proven track record of hosting some of the world’s top events, and our commitment to improving our facilities, we are poised to continue to be a venue of choice for the best and fastest events in the sport of sailing for decades to come,” said Keyworth. The Rhode Island Sailing Events Commission will also advise the Governor on the feasibility of using Fort Adams State Park in Newport as a venue for serving U.S. Olympic sailors. RIBCRAFT, a Marblehead, MAbased manufacturer of professional grade rigid inflatable boats for safety professionals, military agencies, yacht clubs and recreational boaters, has launched their redesigned website. The interactive site features responsive design with simplified navigation, providing easy access to model information across all platforms. The simplified model pages provide specifications and features in an easy “one look” format with immediate access to photo galleries. The first to offer a “Build a Boat” feature in 2005, RIBCRAFT has redesigned the “Build a RIB” function to provide an automated complete model experience for the visitor by allowing them to select and view all options with photos and concise descriptions. On completing a build, a detailed quote is generated in real time. “With more and more people using tablets and mobile devices to go online, the new site allows us to better reach our customers and improves the sales process,” said Matthew Velluto, RIBCRAFT’s Director of Business Development. “The site is a powerful, independent tool that can be easily used by our sales team and consumers alike. It’s cutting edge for the industry, and sets a standard. We are very pleased with results.” You’ll find the new website at ribcraftusa.com. Oakley Capital Limited, a privately owned asset management and financial advisory business founded by British businessman and sailor Peter Dubens, has acquired a majority stake in North Technology Group (NTG). Comprising North Sails, EdgeWater Power Boats, North Cutting Systems, North Thin Ply Technology, and Southern Spars, NTG will continue to be headquartered in Milford, CT.
For more information, visit northsails.com, northcuttingsystems.com, southernspars.com and ewboats.com. After serving small boat sailors and paddling enthusiasts for over half a century on the Post Road in Westport, CT, The Boat Locker is moving to a new location in Bridgeport’s West End. The new store, located at 706 Howard Avenue, will open May 1. With 17,000 square feet of floor space and high ceilings, The Boat Locker will have fully rigged Hobie Cat catamarans, RS Sailing dinghies, Laser sailboats and Zim Sailing Club 420s on display indoors. There will also be a wide selection of Hobie kayaks, stand up paddleboards by Bic and Hobie Cat, plus parts, accessories and related apparel. The new store is close to Interstate 95, between exits 25 and 26, and has plenty of secure parking. A grand opening celebration is planned for May. Store hours are 10am to 7pm Monday through Friday, and Saturday10am to 5pm. For more information, call toll-free 855-745-7245 or visit boatlocker.com or facebook.com/BoatLocker.